Biometrics requirement for applicants from the Philippines - Gateway to Canada | Canada Immigration Consultancy! 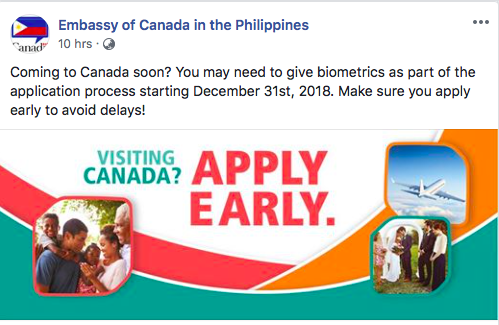 Starting December 31, 2018, applicants from the Philippines will now be required to give biometrics as part of the visa application process. Biometrics is the measurement and statistical analysis of people's unique physical and behavioral characteristics. The technology is mainly used for identification and access control, or for identifying individuals who are under surveillance. This will be an added process which may cause delay in the visa application process. You should file your application early!